'Pirates' fans have been wondering what would happen with the franchise since Gore Verbinski stepped down to direct "Bioshock" for Universal. 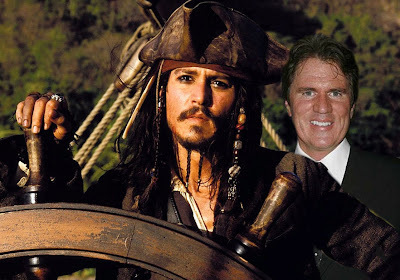 Sure Johnny Depp is onboard for further adventures of Capt. Jack, but what about a script and more importantly a director. Enter Rob Marshall, a guy who previously has done mainly musicals i.e. Chicago and this year's "Nine" (not the animated film). If Marshall is hired, it toes the line with what Oren Aviv told Coming Soon. He told the news outlet back at Comic Con it was important to scale back the fourth film and concentrate more on the characters. He said, "It's important to get the story right and it's important to me to scale it down, because we can't get bigger." He continued his point by saying, "I want to kind of reboot the whole thing and bring it down to its core, its essence, just characters." Rob Marshall doesn't seem like an obvious choice at first, but when conisdering Aviv's comments at Con, he shows the potential to be the guy that could scale back the franchise. Let's just hope Marshall doesn't turn 'Pirates 4' into the Pirates of the Penzance. More news on "Pirates of the Carribean 4" as it develops.